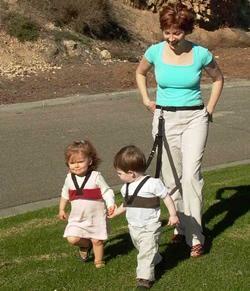 The Prosecution: Child leashing is a technique utilized only by the most-lazy and self-centered parents. As a parent, if you are unable to actually spend time watching your child in public, perhaps you need to rethink the activities that you are doing with your children. Maybe it is time to get off the phone, stop chatting with your co-leasher about what a whore Shelia is, put your coffee down and drop the shopping bags to actually engage with your child. You can actually see the shame of these children as they lead their masters, I mean parents, down the street. My son saw a child leashed the other day and wanted to know what the kid did to deserve that. I told him that he was born into a house where his parents had a dog that ran away and the little boy was trying to make them feel better by pretending to be Scraps for the day. The only family that should have ever leashed their child were the Kents. (I can excuse you if your son can fly, then maybe it is ok to put them on a string). However, if your child runs at 2 miles an hour and has a propensity to want to look at anything that blinks, skip the leash and hold their hand. If you can teach your dog to shake, you can teach your child to hold a hand. I only use that analogy because I assume that you leashers get all of your parenting tips from the Dog Whisperer. The Prosecution rests. The Defense: Child leashing is a valuable technique that ensures the safety of children in busy places. Children that are either prone to walking off or that cannot be trusted to stay close need extra attention. We live in a society where you cannot trust strangers. Leashing the child is the only way to ensure that the child does not wander off or is not taken. There has never been a case of a child that has been lost or kidnapped while leashed. While the leashing may not look great, it is a tool for those who want to do everything they can to protect their children. The defense rests. The Verdict: Acting as a representative of Stunt Dad Nation, I find the accused guilty on all counts. Stunticution: The Leashers are hereby sentenced to be leashed and paraded through the streets by their children on an annual basis during a new holiday called Leash Wednesday. The Leashers will then be required to take their children to an amusement park or shopping environment of the previously-leashed child's choosing where they will be forced to pay attention to their children and engage in activities that force them to utilize their new parenting skill— watching their children.